Most of the relatively few wildflowers that keep us (and the butterflies) waiting until summer before making an appearance are well worth waiting for, and beautiful Betony is certainly no exception. Betony flower heads, somewhat oblong and about 3cm across are on almost leafless stems. Plantsoccasionally grows to a height of 60 cm, but 30cm is more typical. The bi-lobed flowers, 12 to 18mm long, are a beautiful reddish purple. This striking wildflower is fairly common across most of southern England and Wales but it is absent from northern Britain and from most of Ireland except the far south west. Betony is native to Europe, Asia and northern Africa, but like so many plants used in herbal remedies it has been introduced to many other temperate regions. 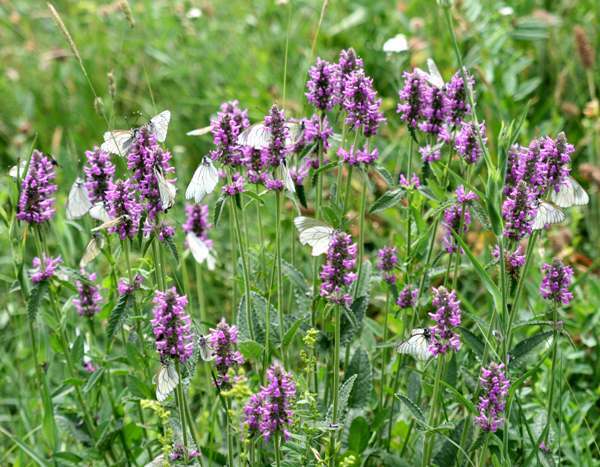 Betony is a lowland wildflower that shows a preference for dryish light soils such as on sunny banks and hedgerows, on heathland and other grassy places including, occasionally, the undisturbed margins of arable fields. 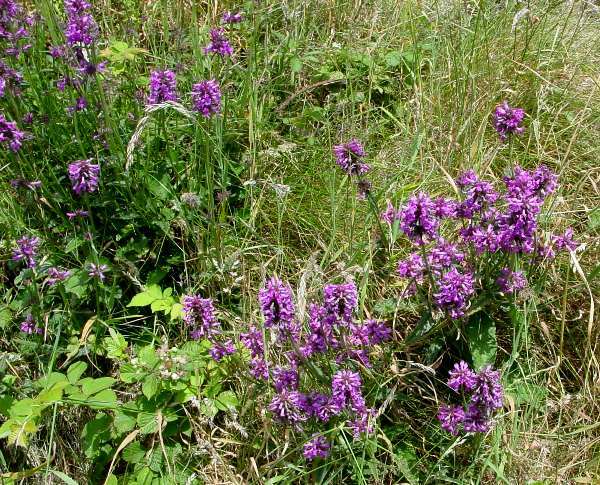 Betony is a common sight in old country churchyards, where it was planted in the past in the belief that it had powers that would ward off ghosts, goblins and other unwelcome guests.. 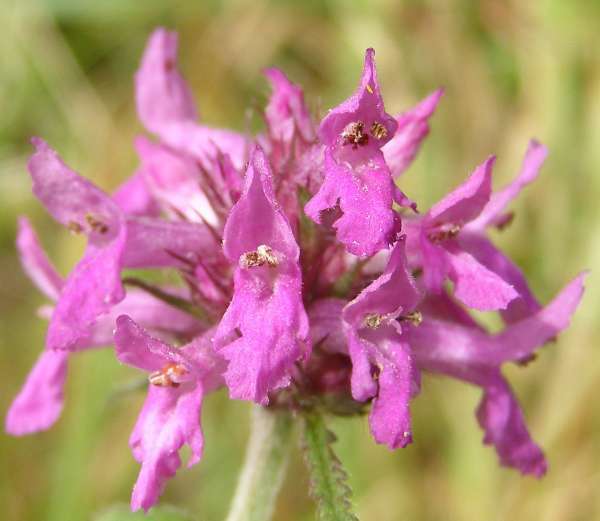 In Britain and Ireland Betony puts in an appearance in late June and continues blooming until the end of September. In the past various medicinal and magical powers were ascribed to betony:the Romans used it to treat headaches, and in the Middle Ages it was thought to serve asprotection against witchcraft. Stachys, the genus name, means 'spike of flowers', and plants in this genus do indeed produce flowers in spike form. The specific epithet officinalis, literally meaning official, indicates that this plant was recognised as having valuable pharmaceutical /medicinal properties. Hedge Woundwort Stachys sylvatica and Marsh Woundwort Stachys palustris are similar in stature and form but their whorls of flowers are much more widely spaced and the upper lips of their flowers are generally more hooded. The Betony flowers shown on this page were photographed in Bulgaria in June and in West Wales during July.